WLAN RST. This button has a double feature. Primarly serves to restore the WiFi to the factory configuration. 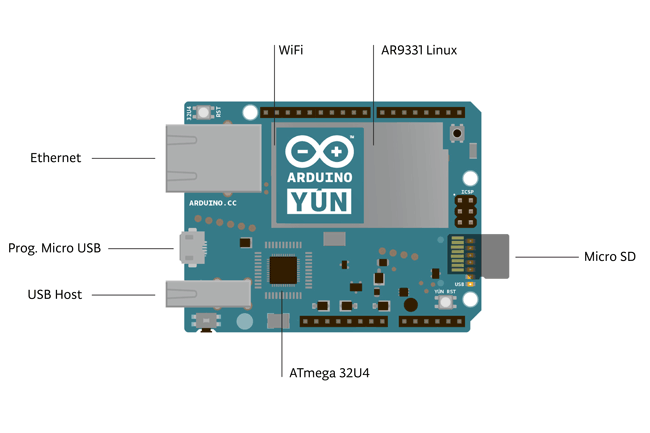 The factory configuration consist to put the WiFi of the Yún in access point mode (AP) and assign to it the default IP address that is 192.168.240.1, in this condition you can connect with your computer to the a WiFi network that appear with the SSID name "Arduino Yun-XXXXXXXXXXXX", where the twelve 'X' are the MAC address of your Yún. 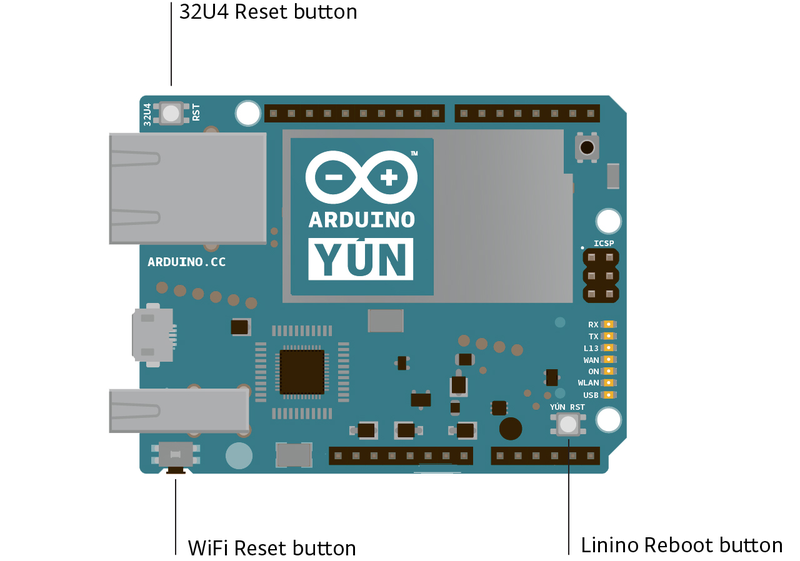 Once connected you can reach the web panel of the Yún with a browser at the 192.168.240.1 or "http://arduino.local" address. Note that restoring the WiFi configuration will cause the reboot of the linux environment. To restore your WiFi configuration you have to press and hold the WLAN RST button for 5 seconds. 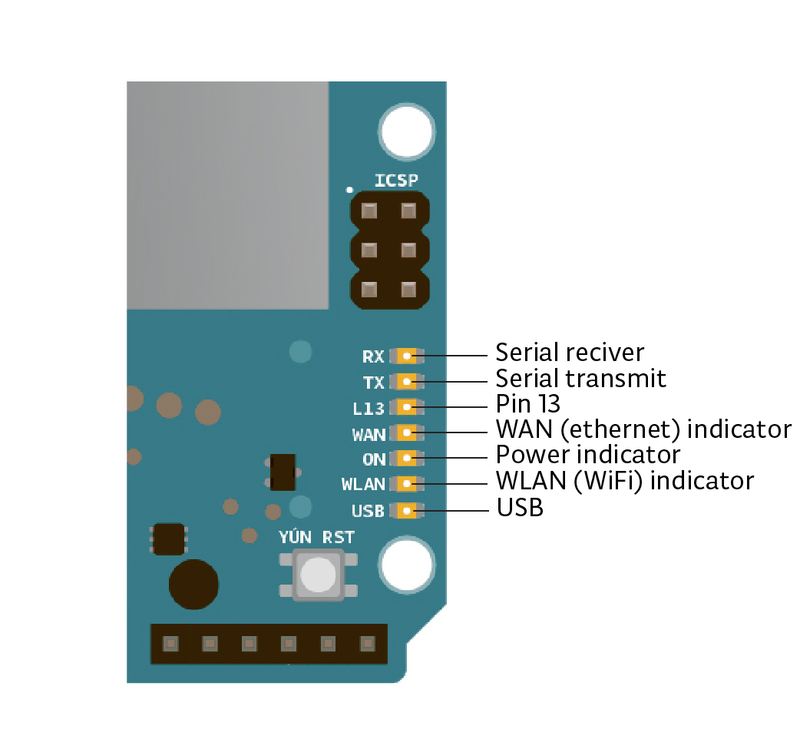 When you press the button the WLAN blue LED will start to blink and will keep still blinking when you release the button after 5 seconds indicating that the WiFi restore procedure has been recorded. The second function of the WLAN RST button is torestore the linux image to the default factory image. To restore the linux environment you must press the button for 30 seconds. Note that restoring the factory image make you lose all the files saved and softwares installed on the on-board flash memory connected to the AR9331. 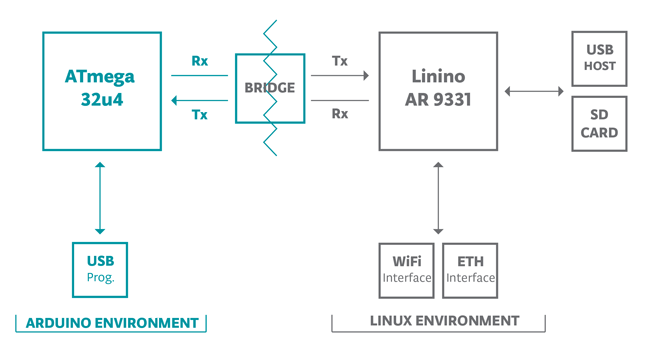 The onboard Ethernet and WiFi interfaces are exposed directly to the AR9331 processor. To send and receive data through them, use the Bridge library. To configure the interfaces, you can access the network control panel as described in thegetting started page.